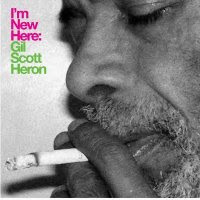 First a confession, though Gil Scott Heron has been recording since 1970 and is widely considered one of the critical artists in the early development of rap, this is my entry point for this artist. To date, I have heard nothing else in his catalog, aside from those older tracks he included in his transcendent 2010 Coachella set. And to be honest, it's impossible for me to separate my impression of Gil Scott Heron at Coachella with the fundamental appeal of this CD, which is that of witnessing an elderly artist coming to peace with his life, both what it has been and what it has meant. Structurally, this is a very different beast than anything else listeners will encounter this year. Only three of it's fifteen tracks (Me and the Devil, I'll Take Care of You, New York Is Killing Me) play as traditional songs, each making great use of his gravelly, whiskey-soaked croon. The rest are an assortment of Heron's plain spoken poetry set to all manner of inventive skeletal backings, interspersed with even shorter spoken interludes. But it all adds up to a wonderfully cohesive whole, and baring the release of a new Mountain Goat's masterpiece on the order of The Sunset Tree ...I have to believe this will go down as the year's most intimate release. For fans of soul and hip hop, this is a must, an under appreciated master's poignant return. But I hope even those who don't naturally gravitate towards soul or hip hop will give this a listen. It is easily one of the most unique releases of the year. Download Cherry Picker's Best Bets: Me and the Devil , I'm New Here , I'll Take Care Of You , New York Is Killing Me .